For the International Islamic University of Malaysia (IIUM) and University Malaya (UM) players, the last round of the 2008 GACC was a dramatic finale . Both team are fighting for Malaysian best team prize. In the end, UIA coached by Fadli Zakaria managed to edge the UM team with only half points- thanks to the most important and thrilling game in table 8 where Ahmad Fadzil Nayan create an upset by beating Chinese WIM Gong Qianyun . Fadzil Nayan (right) beat WIM Gong Qianyun (left) in the last round ! Below are my analysis of the game with the help of Mr.Fritz 11. Although Qianyun had the better position , Fadzil try hard to confuse the matter and in the end, the Chinese WIM made the decisive blunder which cost the game. 1.d4 f5 2.g3 Nf6 3.Bg2 g6 4.e3 Bg7 5.Ne2 d6 6.b3 c6 7.Bb2 0–0 8.0–0 Qe8 9.Nd2 g5 10.c4 e5 11.dxe5 dxe5 12.Nf3 Ne4 13.Nc3 Nxc3 14.Bxc3 g4 15.Nd2 Be6 16.f3 h5 17.e4 f4 18.Rf2 Nd7 19.Qf1 h4 20.fxg4 hxg3 21.hxg3 fxg3 22.Rxf8+ Bxf8 23.b4 a5 24.a3 Qd8 25.c5 axb4 26.axb4 Rxa1 27.Qxa1 27...Nxc5! A nice tactical blow from Qianyun. 28.Nf3 probably 28.Nf1 is better but certainly not 28.bxc5 ?? 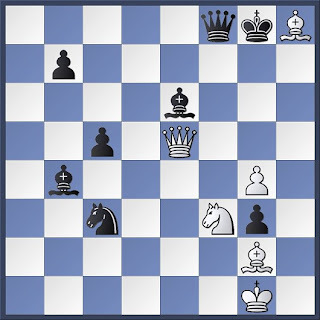 Bxc5+ and it's all checkmate 29.Kh1 (29.Kf1 Qd3+ 30.Ke1 Bf2+ 31.Kd1 Bb3+ 32.Kc1 Qc2#) 29...Qh4+ 30.Bh3 Qxh3# 28...Nxe4–+ 29.Bxe5 Bxb4 30.Bd4 c5 31.Bh8 Qf8 32.Qe5 Nc3? According to Fritz, this move gives white a counterplay. Fritz suggest 32...Ba2!? 33.Qxe4 Kxh8 34.Qe5+ Kg8 35.Qxg3 Bc3 and it look like black is clearly better. I watch the critical position below during the game. Fadzil is two pawn down and he can't afford to play passively because black passed pawn ( b and c pawn) will roll down. During the game, I thought 33.Bf6 would be the obvious reply and i think it's more pleasant to be white because he is attacking and black king is an open target compare to white king which is relatively safer. Marcus Yeoh who is kitbizing the game with me have different idea. He thought black is better. In time trouble Fadzil choose 33.Ng5?! 33.Bf6 is the correct move 33...Bf7 34.Qg5+ Kh7 35. Bf1 (thretening Bd3+!) 35... c4 36.Bxc4 Qc5+ 37.Bd4 Qxg5 38.Nxg5+Kg6 39.Nxf7 winning. Instead, the game continued with 33...Bc4? 33...Bf7 34.Bf6 c4 would save the game 34.Bf6 Ne2+ 35.Kh1 Fadzil missed the better move 35.Qxe2! 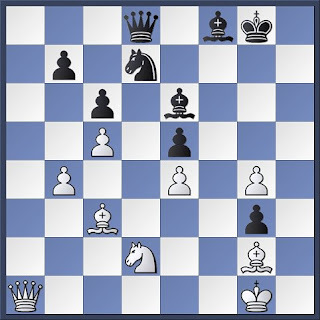 Qxf6 (35...Bxe2 36.Bd5+ Qf7 37.Nxf7 winning) 36.Qxc4+ Kh8 37.Ne4 winning 35...Qh6+ 36.Bh3 Bc3?? A terrible blunder. According to Andrew Ooi , Qianyun still have sufficient time left. 37. Qe8+ and black resign because it's mate in 2 after 37...Qf8 38.Qg6+ Qg7 39.Qxg7# 1–0 Andrew Ooi mentioned that the Chinese WIM was so upset with her blunder that she crumpled her scoresheet and throw into his bag after the game.